Introductory information on asexuality. If you’re new to the concept of asexuality, whether you’re figuring out who you are or know someone who just came out as ace and want to learn more, here’s where to start. Asexuality is OFFICIALLY not a disorder, according to the APA. The images above are from the DSM-5, which is the latest edition of the American Psychiatric Association’s Diagnostic and Statistical Manual of Mental Disorders. The DSM-5 is a really important book. It is used by doctors and mental health care providers around the world to diagnose mental disorders. The DSM-5 explicitly and clearly recognizes asexuality, and says that if a person is asexual, that they should not be diagnosed with Female Sexual Interest/Arousal Disorder or Male Hypoactive Sexual Desire Disorder. This book reaffirms that you are valid, your feelings are real, and that you do not have a disorder for feeling that way. Anyone who claims otherwise is wrong. They do not know what they are talking about. You can point them at this book as proof that they are wrong. If a lifelong lack of sexual desire is better explained by one’s self-identification as “asexual”, then a diagnosis of female sexual interest/arousal disorder would not be made. 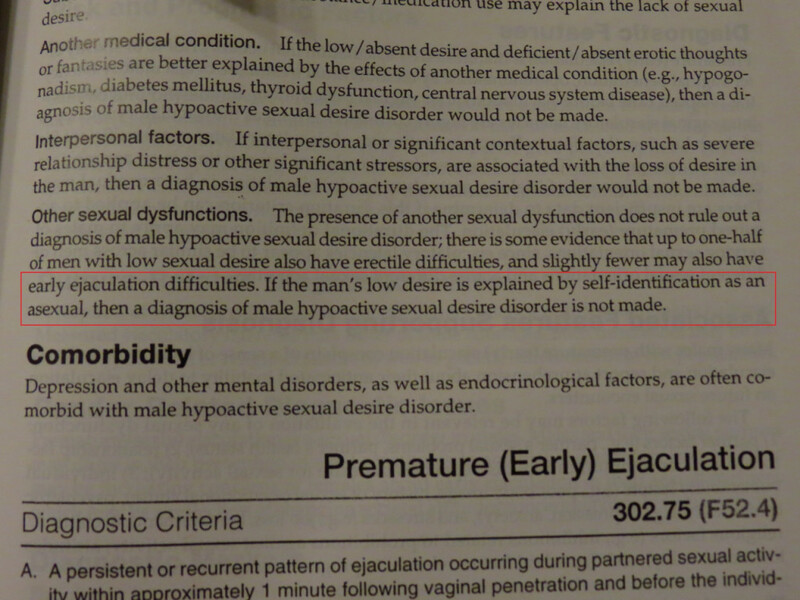 If the man’s low desire is explained by self-identification as an asexual, then a diagnosis of male hypoactive sexual desire disorder is not made. Certainly, this is a vast improvement over what was in the DSM-IV. Not only was there no asexuality exclusion there, but “interpersonal difficulty” was one of the diagnostic criteria for HSDD. That meant that even if you were fine with being asexual, you could still be diagnosed with HSDD if someone else had an issue with it. Additionally, the description of “Lifelong Generalized HSDD” was very similar to how people describe asexuality. There are problems with what’s in the DSM-5. “Scare quotes”: One of the most noticeable issues is that in the section for FSIAD, the word asexual is in quotation marks. This has the unintended side effect of delegitimizing asexuality in the minds of the reader. They might see asexuality as a real thing, but have more doubts about “asexuality”. Self-identification: As written, these exclusions require that the patient say “I’m asexual” for them to apply. That’s fine for those of us who know who we are, but what about those who don’t? You can’t self-identity as asexual if you’ve never even heard of asexuality. And there are hundreds of thousands, if not millions, of people out there who are in that situation. I’ve personally heard stories of people who have gone through “treatment” for HSDD. It didn’t work and made them miserable. Only afterwards did they discover that they were ace. Self-identification only works when there is widespread awareness. Psychiatrists need to be proactive in this regard. Certainly, a psychiatrist should never “diagnose” someone as asexual, but they need to be providing the tools and information for their patient to make that determination on their own. Asexuality is not mentioned in the Desk Reference version of the DSM: The DSM is a thousand page, 3 lb. monster of a book. Because of this, there’s an abridged variant, that only contains the diagnostic criteria. 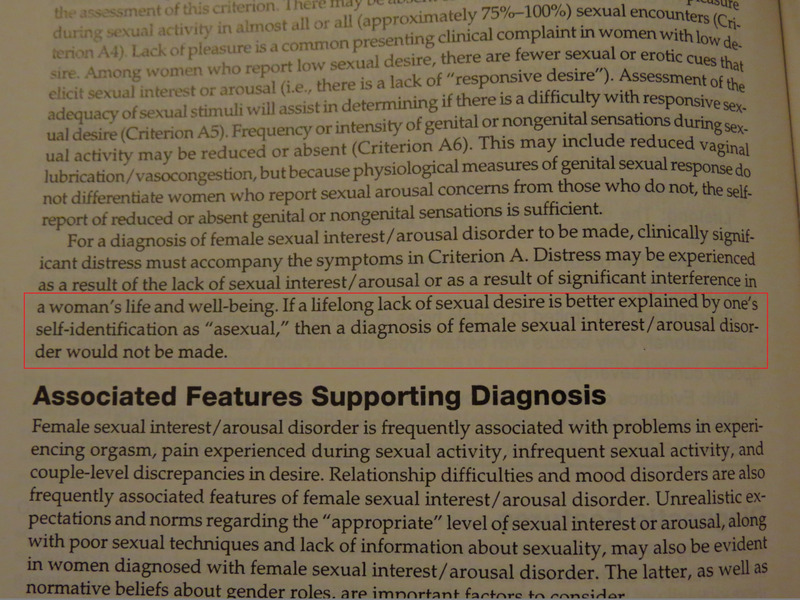 Unfortunately, there’s no mention of asexuality in the diagnostic criteria for either disorder. The asexuality exclusion is located in a different section of the text. That means that if someone just looks at the diagnostic criteria in the Desk Reference, they’re not going to see it. Clinically Significant Distress: Part of the diagnostic criteria for these disorders is that there must be “clinically significant distress”. But… Repeatedly being told that you’re broken can cause “clinically significant distress”. Wondering why you’re so different from everyone else can cause “clinically significant distress”. Being pushed to fix something when there’s nothing wrong can cause “clinically significant distress”. None of those are signs that you have a disorder, those are signs that the world around you has a disorder. I would like to make it clear that I am not saying “We are valid because we’re in this book.” We are in this book because we are valid. Posted in Asexuality 101	| Tagged asexual, asexual awareness, asexual visibility, asexuality, open letter	| Enter your password to view comments.